A mother and her 13 year old daughter were subjected to serious injury in an incident in which they were enjoying a ride in the ferris wheel today (4) at about 11 in the morning as a part of the wheel has collapsed. 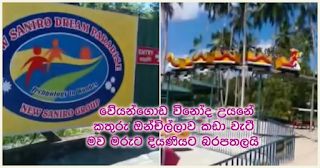 This accident has taken place at 'New Saniro Dream Paradise' theme park in Naiwala area, Veyangoda. daughter who faced this accident herself was treated at the intensive care unit at Gampaha Hospital and subsequently has been admitted to the Colombo General Hospital for further treatment. A fully-fledged police investigation is underway in this connection. A statement has been recorded from the person who was in charge of the ferris wheel at the time of the tragedy.